For over the last 10 years I’ve been interested in holistic (mind body spirit), alternative therapies based on the right nutrition, Traditional Chinese Medicine, Ayurveda, herbalism, medicinal plants, energy therapies, electroacupuncture, bioresonance therapies, zapping and working with frequencies for reversing and alleviating illness, and then – studying neuroplasticity through neuroscience, quantum medicine and epigenetic (above genome) approach to regaining health. Personal health struggles and also family member loss triggered putting me on this path and I never looked back since. I saw how crippling medical system is working from inside out and how it often helps to put a patient to an early grave. Once I started digging and looking behind the curtains of what people are generally lead to believe ( medical system as the one and only solution to all diseases… really…?! ), I was hooked on helping getting this suppressed information out there and help people as much as I can by delivering a choice. One door lead to another, then a new set of doors of perception started opening, then a window opened and another and then…there was nothing to stop me from this ongoing process of learning and gathering information and knowledge connected to healing. It’s an ongoing process and learning in this matter will never stop. I will include here some basic information that I’ve already shared over the years with many other knowledge thirsty people who wanted to have a choice and be able to decide for themselves and their close ones which way to health, which health protocol and therapy makes the most sense for them. What people don’t realise often, is that any of medical diagnose as bad as it may appear carries a notion of closed boxed thinking and labelling into a narrow one way road with a wall at the end of it. Ask yourself what do you usually do with a label, a tag on your newly bought clothes? It’s usually itchy, it pinches and irritates the skin so much that we need to cut it off in order to feel relief. Yet when it comes to mental tags/labels, we seem to cling to them without questioning their existence and putting up with the hurt they cause us. Why should it be easier to cut off a tag from your t shirt than an invisible tag inside your mind formed by falling for illusionary social constructs and conditionings? Everything is relative (any fans of Einstein’s theory of relativity here? 😉 ). You can look at everything from different perspective. But in order to do so, you need to be actually aware that those other perspectives exist at all. That’s why I want to share some of those different points of views here and looking at “problems” from different angles and having different approach towards them. I hope somebody will find these movies and lectures mentioned here helpful. I am a bit mad about this alternative sources to say the least. I have been doing research on this matter (and reliability of the sources ) for many years. I read countless books, alternative articles by world famous alternative doctors, naturopaths and health practitioners. I watched hundreds of hours of lectures, documentaries, interviews with most successful people in the field of healing, I enrolled to countless of Health Summits (Cure to Cancer Summit, Longevity Now Conferences, Detox Summit, Quantum Medicine and Meta Health Summits, Integrative Nutrition Summits etc.) lead by world’s most respected doctors and practitioners in alternative holistic approach to treating dis-ease etc. I truly and sincerely hope those links that I attach here will awake even more of your curiosity as it is just a small percentage of what is out there to discover. I don’t believe in labels and stiff formal titles, yet as I am no doctor but a devoted researcher, please do NOT take anything I say here for granted. Watch the movies, read, do research and some thinking on your own and then decide for yourself and your loved ones which road to healing will be best beneficial to you and what resonates with you. Al, information I put here is intended for educational purposes only and are not intended to diagnose, treat, cure or prevent any health or medical disorder. 2. Watch also the interview with Charlotte Gerson ( dr Max Gerson’s daughter ). She’s over 90 years old now, she’s truly amazing and healthier than many 20 year old I know, speaks so sincerely here about natural practices and healing trough nutrition. Do more research on her and her father’s work (dr Gerson). 3. Very important movie for all cancer patients and those who want to avoid cancer threat as much as they can in the future, the movie is about Dr Gerson’s Theraphy ( read more about dr M. Gerson, and the clinic gerson.org ).Briefly speaking, this German dr was curing degenerative and chronic diseases and cancer with cleaning out toxins from patients bodies with special nutritional programme and coffee enemas). It’s more than highly recommended to watch this movie – “The Gerson’s Miracle” (buy online if you can to support the cause). “The Gerson Miracle” examines many of the elements of the Gerson Therapy, explaining why we are so ill and how we have in our grasp the power to recover our health without expensive, toxic or mutilating treatments, using the restorative forces of our own immune systems. Even the most advanced cases of cancer can be successfully reversed using this method. While the results seem miraculous, the real “miracle” lies within our own body and its healing processes. 5. Next one covering the Gerson Therapy as well is called “Dying to have known” (literally as sometimes you need to be almost dying in order to shift your thinking into a higher level of perception and finally get this wake up call that your own body is sending to you. It is simply letting you know that you are doing something wrong and therefore you need to change and break this vicious circle. You need to let go off habits that no longer serve you and discover other ways to actually heal and cure yourself. “We live in a world of outrageous lies fronted by corporate interests, but one of the fundamental undeniable truths of biology is that cancer is curable. 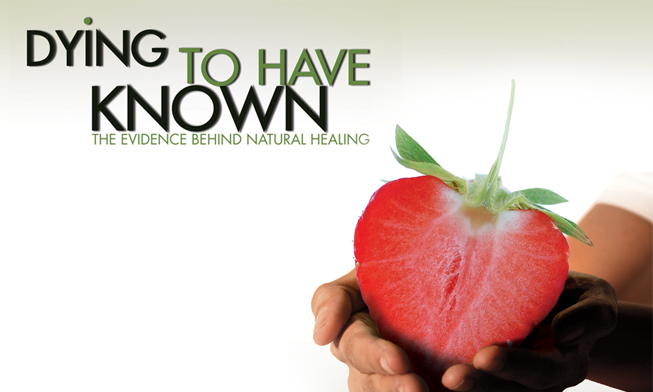 The cures have been known for decades, and they’re readily within reach of people everywhere. But we are not allowed to have any knowledge of these cures for the simple reason that the cancer industry is a multi-billion-dollar industry that needs disease to stay in business. “Cancer is Curable NOW” pulls together wisdom from more than 30 international holistic professionals who have been working passionately in the field of cancer alternatives — doctors, scientists, researchers and writers from around the world. Full version movie of Healing Cancer from inside out” can be found under this link on vimeo or here on dailymotion broken into 3 parts. The remarkable story of Stanislaw Burzynski, MD, PhD who boldly challenged the Food and Drug Administration for his right to begin FDA-approved clinical trials on a breakthrough cancer treatment he developed. Burzynski, the Movie is an internationally award-winning documentary that tells the true story of a medical doctor and Ph.D biochemist named Dr. Stanislaw Burzynski who won the largest, and possibly the most convoluted and intriguing legal battle against the Food & Drug Administration in American history. Note: When Antineoplastons are approved for public use, it will allow a single scientist to hold an exclusive right to manufacture and sell these medicines on the open market. Potentially leaving the pharmaceutical industry absent in profiting from the most effective gene-targeted cancer treatment the world has ever seen. It’s just a tip of an iceberg that I touched here with my recommended choices to fill anybody interested into converting previous state of ignorance or simple “how could I know” into – well, now you know…so what you gonna do about it? Let’s start with making a conscious decision to reclaim your health, shall we? There are many other links I could advice on watching but for a – let’s call it a starter kit that delivers different Truth on the matter of dealing with “incurable” dis-eases, it would be definitely sufficient. Hopefully those 8 points above will light up a little bulb of awakened consciousness and curiosity into this topic. After all it’s health we are talking about here. And I can’t imagine anything more important to a single person than that. I will be posting more advanced information concerning health and wellness in doses. Stay tuned. Remember to question everything, even me. Do not be influenced by me. Inquire. Search on your own. Make your own truth out of what’s resonating with you. Think. Connect the dots and facts. Don’t let ignorance and blind beliefs lead you or a member of your family to an early grave. In the era of Internet and accessible information, ignorance is a choice … not worth pursuing. To read even more IMPORTANT sources and recommendations – please go to my 2nd post on Alternative Cancer and Chronic Dis-eases Treatments here. I ѕeriously love ʏοur website.. Excellent colors & theme. I am glad you found your way to my web space and truly hope you will gain much from what I’m posting x If You wish to keep up with up to date short blips of recommendations and informations like me on facebook. I tend to post links to knowledge that shaped me into who I’ve become. No pressure. I know this web site offers quality dependent posts and additional material, is there any other site which provides these information in quality? Hi Akira, so sorry for a late reply, was on holidays deep in the nature with no WiFi connection whatsoever. What I am actually working on is to bring all those information you are looking for in one place here. It\s a young blog and work in progress. Wish I had more time to focus only on writing here so that I could deliver all my knowledge and other websites I take information from at once but time is limited for me for the matter of working. Yet I will do my best to post more blog posts with more information as soon as possible. Meanwhile I try to gather on the go all my favourite websites with alternative, non confromist information in the page tab above called Links/People/Knowledge is power. Will update it soon as well. We’re genuinely fascinated together with your writing ability and in addition while using the design to your website.. same band combiners Is the a new compensated subject or even would you transform that all by yourself? In any event . maintain the excellent excellent composing, it truly is uncommon to determine a fantastic web site such as this one these days. Thank you for collecting and sharing your research around the net. I love it and will be back for more. That page has the movie but also the same text as on your blog. Could you explain this? Gives a credible explanation to why he is not world famous yet. Hi Harry, sorry for late reply, didn’t notice your comment. I am glad you stumbled across my blog and liked some info here. Thank You for your input about Burzynski and sharing a link about The Other Burzynski Patient Group. It’s important and interesting. What I do here is basically sharing, passing forward information about existing alternative cancer therapies out there that have documented cure rates, people can read, do their own deeper research, like you, and choose which theraphy sounds the most reasonable and resonates the most with them. Personally I am a fan of Gerson theraphy, as you can do it at home, but also combination therapies, combining bits of Gerson with others and following your own heart’s lead. It is important to work on emotional and psychological state as well and not only on physical. Getting into resolving past traumas, emotional and psychological blockages that block the flow of “chi”/”prana” in the body by EFT, NLP techniques, Tai Chi – Qi-Gong excercises, meditation, affirmations, visualisations, but also – for me – very important – to work with plant based medicines (spirit of the medicinal plants help you to know what you need to know in order to activate healing mechanisms in your body as well ),that help you face your demons and release them and in this way – unblock yourself for healing. All therapies I share are just to be PUT OUT there so that people can get a closer look at them – and if interested – dig deeper. I am just a messenger here – I want people to become their own researchers and start thinking for themseves, which I think is what’s happening here.